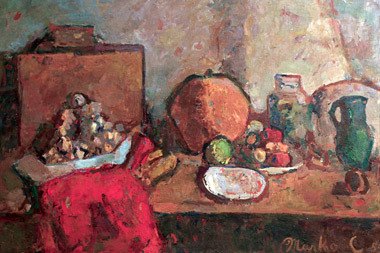 The painting – Still Life with Pumpkin and Drapery is one of three Marko Čelebonović’s paintings in the Dedinje Royal Compound Art collection. Together they represent different themes that this author explored in his works. 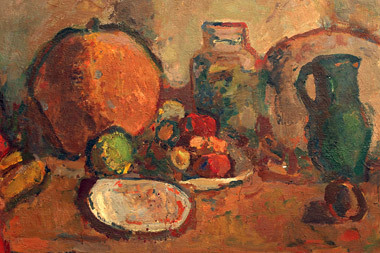 Čelebonović painted Still Life in 1955. It arrived in the Art Collection through the acquisition by the Cabinet of President of the Republic. Marko Čelebonović often found inspiration for his work in everyday life, as well as home interiors, as can be seen in Still Life from the Art Collection of the Dedinje Palaces. 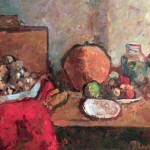 In this painting we see various fruit and kitchen items arranged on the table, which at the same time defines and limits the space of the painting. Closest to the viewer is red drapery that envelops a bowl with unidentifiable contents, probably nutshells. Empty plate, plate with fruits and green pitcher are all arrange in the horizontal row behind it, and further away are rectangular board, pumpkin and a glass pitcher. The form of each item in the painting is emphasized by dark lines and shadows, but details remain spars, while colour treatment dominates. The basic colour of the painting is brown, which further accentuates the different colour of objects. Red drapery in front and orange pumpkin in the back are connected by the dynamic of green-red-white-blue of the fruit and pitchers in between. Only item that disrupts harmony and burdens the left side of the painting is the rectangular board located behind the drapery. 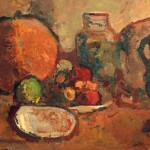 Čelebonović’s Still Life is a random fragment of the kitchen interior rather than an arranged setting. It is a reflection of an instant inspiration with simple everyday life objects seen trough the inner eye of an artist. Of all the possible painting genres still life was scorn by the critics and theorists as being the lower form of art, least noble, without narrative, it was considered a showcase of the technical capabilities of an artist. Still Life – a painting or drawing of items such as fruit, flowers and household objects which are usually arranged on a table, was seen as replication of inanimate objects that demand little of the artist’s imagination. Through history still life was first painted as a decoration, than it became an addition to the portraits and figural compositions, it reflected the status of the painted person or carried a hidden symbolic meaning. In the 16th century trough the work of Dutch, English and Spanish painters Still Life began its path towards independence. Disagreement between theorists on the significance of Still Life was intensified on the verge of the 20th century when painters of impressionism and post-impressionism changed their approach to this theme. These artists demonstrated that still life allows the artist an enormous element of control in the choice of objects and in their arrangement, and by exploring correspondence of form and colour among them, the artist can comprehend and even create the structure of the painting. Marko Čelebonović discovered his talent for painting during the 1930’s when he arrived in Paris to continue his study of law. There he had his first lectures in painting, and in Saint-Tropez, he continued the path of discovering his own style. As a painter he matured alongside French and Yugoslav colleagues. His oeuvre consists mainly of portraits, figural compositions, and intimate household interiors, landscapes and still life. Although he was inspired by the human figure and spatial compositions in the technical sense he gave primacy to the colour allowing it to jeopardize the structure of form. Čelebonović exhibited his works many times alone or in Yugoslav or international group exhibitions. As a professor at the Belgrade Art Academy he taught and influences many young generations of Yugoslav painters.